I've started this new thing recently - of going to various places in Bangalore very early in the morning and take some shots. 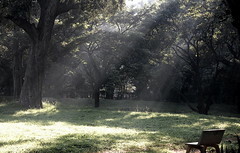 Last week was the first week and the place was cubbon park and surroundings. Parked the vehicle at the cubbon park entrance near corporation circle and wandered inside the park, in front of Vidhana Soudha, then back, going towards Vittal Mallya road. Managed to get some decent pictures. I play cricket too during weekends. So, this is going to be tough to make it to these photo shoots on the days we play cricket. Lets see how it goes. I'm yet to think of a destination for the next shoot.